4015 Indian Creek Drive: A real find: Postwar catwalk-style construction. Real residential units and low-maintenance catwalk construction makes this an ideal beach getaway or low-upkeep residence just one short block from the beach and right on Indian Creek! 5700 Collins Ave: :Luxury high-rise on Millionaire's Row with frontage directly on the Intracoastal Waterway. Super pool, gym, luxury services, restaurant on site. 5601 Collins Ave: Oceanfront Luxury on Millionaire's Row! Take the elevator right to the beach! MiMo Classic Building has just undergone a multi-million dollar renovation. 5401 Collins Ave: Oceanfront Luxury on Millionaire's Row! 5255 Collins Ave: Millionaire's Row! Oceanfront luxury residences. 5313 Collins Ave: Oceanfront high-rise with great beachfront pool and all luxury features. 5151 Collins Ave: Oceanfront luxury high-rise on Millionaire's Row. Super pool, gym, luxury services. Can be rented short-term as vacation rental. 215 30th St: Pre-war 1935 garden apartments just steps from the Ocean and close to South Beach. Low maintenance, great location. On the Intracoastal waterway. Prestige address on Millionaire's Row! Search MLS for listings in the 5600 Condo! 2925 Indian Creek Dr! Just steps from the beach, SoBe nightlife, 41st Street shopping and across from Indian Creek. Classic Art-Deco hotel completely gutted and reconstructed to today's standards in 2004! Can be rented by the day, week, month! On site hotel management program available. Search MLS for listings in Alden Hotel Condo! 5838 Collins Ave: High rise at the top of Millionaire's Row, with Intracoastal and ocean views, lovely pool and on-site management, even dock space! 5750 Collins Avenue! Right on "Millionaire's Row" with superb transportation, beach access and all full-service features. Located right across from beach on Intracoastal Waterway. Search MLS for listings in Royal Embassy! And who doesn't know the Fontainebleau? This landmark oceanfront resort property has been the pinnacle of Miami Beach Hotel properties since the 1950s. Today the updated and expanded complex is comprised of several recently-built luxury condominium towers as well as the original hotel structure. Full service, luxurious Las Vegas style resort with restaurants, shopping, nightlife, pools and hot tubs, gyms, and everything else you would need to enjoy a lovely vacation getaway. The hotel condo offers a Management program where owners can use the unit for personal use in addition to enrolling the unit in the Management program in order to generate some income to offset some of the owner's expenses. This is an excellent opportunity to become a part owner in the famous brand that The Fontainebleau has taken decades to create. 2899 Collins Ave: Oceanfront living on Millionaire's Row, yet steps from SoBe and the best of the Beach. Well-run luxury building with 2 pools, great fitness, cafeteria, mini-mart, direct beachfront and, best of all, low maintenance fees. Millionaire's Row! Boutique super-luxury high-rise right on Millionaire's Row! Search MLS for listings in the Ocean Spray! Super-luxury planned private island community! Search MLS for listings in Aqua Island! 4011 Meridian Avenue! You'll find it hard to believe there's a cool waterfront getaway just a couple of steps from the bustle of 41st St. Newly updated waterfront pool and terrace, on-site parking and generous floor plans. Search MLS for listings in The Castille! 3801 Indian Creek Drive: Pre-war 1940 classic hotel adapted to condominium occupancy. Steps from the beach, looks out at Indian Creek waterway. Use as a beach getaway or rent it out without restrictions! 3621 Collins Avenue! Pre-War beachfront art-deco classic. Major renovations now underway. Search MLS for listings in All Seasons Hotel! 5005 Collins Avenue! Millionaire's Row! Oceanfront luxury residences! Search MLS for listings in Carriage Club North! Oceanfront luxury on Millionaire's Row! Twin Condos on the Ocean! 2555 Collins Ave: Close to SoBe, huge balconies, beachfront pool! 5445 Collins Ave: Right on the Beach! 5025 Collins Ave: Stunning new construction! 5900 Collins Ave: Superlative residences on the Waterway! Search MLS for listings at the Grandview! 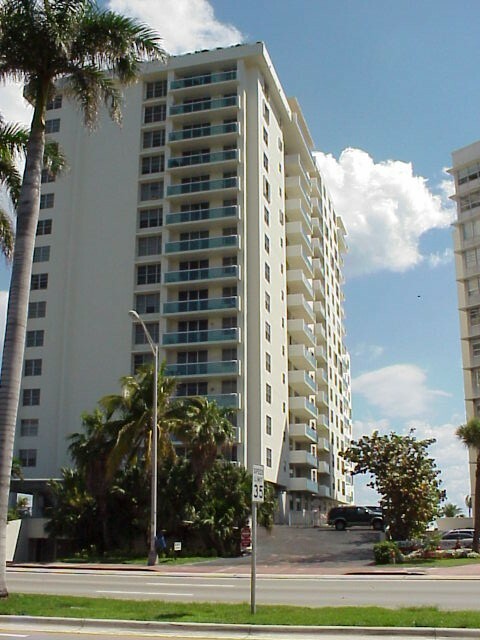 5001 Collins Avenue, Oceanfront high-rise on Millionaire's Row! Search MLS for listings in Versailles Hotel!